Danebury Hill Fort is a historic fort located in Hampshire, England, U.K. This photo was sent in by PG. 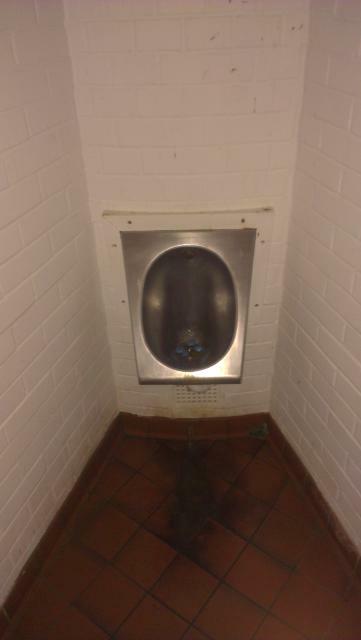 He writes: "Just spotted this single installation at the public toilet block at Danebury Hill fort in Hampshire. It's installed in a a wedge shaped gap as the building is circular - and with no electric lights and the daylight from the door behind you it's hard to see what you're doing - hence the use of fash to grab a decent picture." PG also sends in some helpfully edited highlights from the relevant Wikipedia article: "Danebury is an Iron Age hill fort in Hampshire in England, about 19 kilometres north-west of Winchester. Built in the 6th century BC, the fort was in use for almost 500 years, during a period when the number of hill forts in Wessex greatly increased. Danebury was remodelled several times, making it more complex and resulting in it becoming a "developed" hill fort. The site, covering 5 hectares, was excavated by Barry Cunliffe in the 1970s. Danebury is considered a type-site for hill forts, and was important in developing the understanding of hill forts, as very few others have been so intensively excavated."